I love polka dots and I am so happy that they appear to be a trend this fall! This dress is from Boden, a UK brand, that I like to shop for work wear. It's similar to J.Crew and they end up with lovely combos like this dress. I call this dress "quirky" in the title because it's a super interesting and unique color combo--dark green with light pink. Not something you see everyday. But it works! 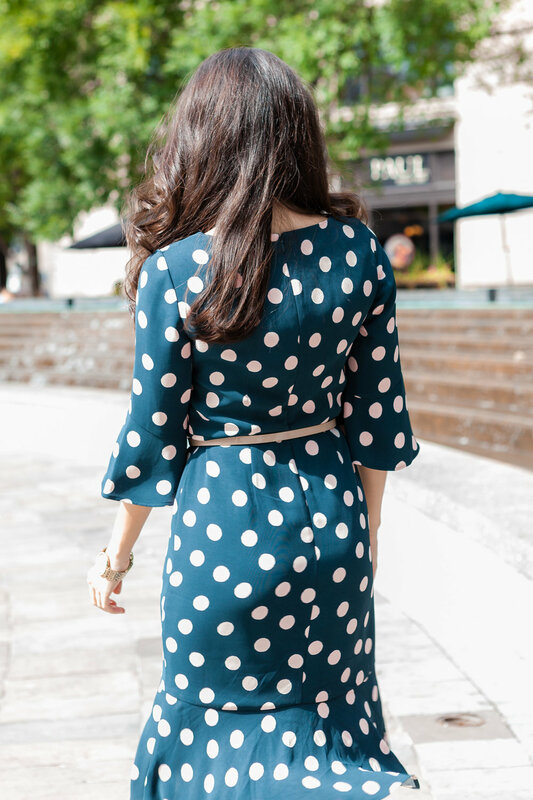 Polka dots aside, the thing that I love most about this dress is the silhouette. The flouncy hem at the bottom is really flattering because it balances out the hip area so very good if you tend to have a curvier hip area in proportion to your body (me!). They also carry the flouncy-ness through to the sleeves, another trend that I am seeing this fall! All in all, it's a flattering dress and good quality. I paired this dress with a belt to define my waist a bit more and break up the pattern a bit. But this dress looks gorgeous with or without the belt. I hope that everyone had a great Labor Day weekend. It always amazes me how the summer seems to just fly by. Stay tuned for more fall looks to come!